FUN PLAY 'N LEARN INTERACTIVE ACTIVITY PLAY CENTRE - It's not just a playpen but a world of fun safezone playcentre for your child which includes a play phone, activity board, picture board and spinning balls where he can develop his independence and sensory skills in his own space play and explore in a safe secure environment with his toys and friends allowing you to go about your daily chores safe in the knowledge that your child is safe. INCLUDES SOFT COMFORTABLE ACTIVITY PLAYMAT & 100 COLOURED BALLS - The "non-slip" soft comfortable colurful reversible activity playmat (180 x 180cm) will keep your child occupied and entertained for hours and together with the playballs will encourage educational playtime. It's a complete playcentre and large enough for twins or your childs' friends to come and play. 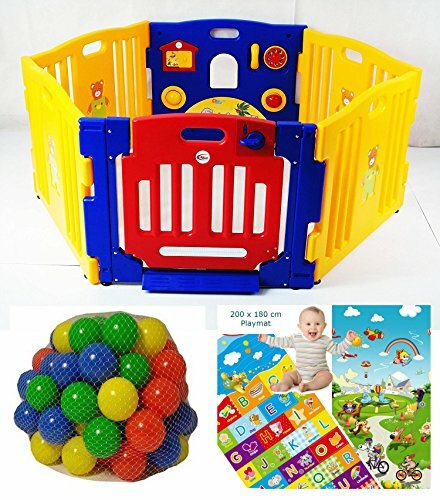 NEED TO MAKE THE PLAYPEN SMALLER, SQUARE OR HEXAGONAL? No problem. Versatile and flexible configuration to suit your space. You can also use as a room divider if you wish. For use indoors and outdoors. SAFE, STRONG & DURABLE - As your child gets older, unlike many playpens which start to wobble and become insecure, the InfantSafe remains safe, strong and durable for many years.